"Our team has been anxiously waiting for the first detection of gravitational waves so that we can rapidly point the Dark Energy Camera at this location and search for the associated visible light," says Edo Berger of the Harvard-Smithsonian Center for Astrophysics (CfA), the Principal Investigator of the follow-up team. "It's one of the most powerful instruments in the world for this purpose." Einstein's general theory of relativity predicts the emission of gravitational waves by massive celestial bodies moving though space-time. 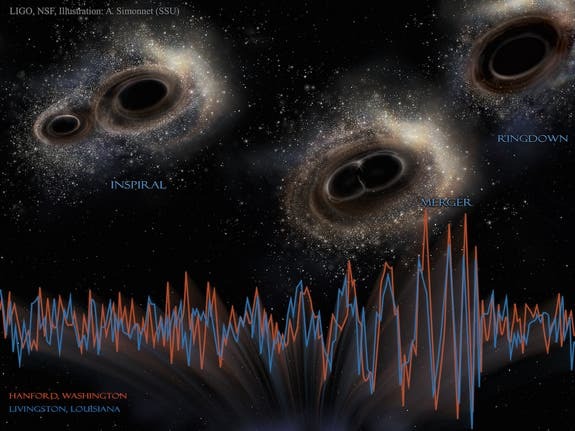 For the past century gravitational waves have eluded a direct detection, but now the LIGO Virgo Collaboration has announced the first direct detection of gravitational waves, emitted by a merging pair of black holes. Catastrophic mergers of binary systems can also produce brilliant and explosive fireworks of light, so a team of astronomers, including at Harvard, sought evidence of such an visible afterglow. Although none was spotted, this work represents the first detailed search for a visible counterpart of a gravitational wave event. It also will serve as a model for similar event follow-up in the future. The joint detection of gravitational waves and light isn't easy, requiring large and wide-fields telescopes to rapidly scan the sky location of a gravitational wave source. The team used the 3 square-degree Dark Energy Camera (DECam) imager mounted on the Blanco 4-meter telescope at the Cerro Tololo Inter-American Observatory in Chile. The search program is a collaboration between astronomers from multiple institutions in the United States, the Dark Energy Survey (DES), and members of the LIGO Scientific Collaboration. The illustration below shows how a brief blip in a signal from the Laser Interferometer Gravitational-Wave Observatory revealed the inspiraling and merger of two black holes. The team rapidly observed the sky location of the first gravitational wave source discovered by LIGO within a day of its announced discovery on 2015 September 16. "Planning and executing these observations immediately became our top priority. It was hectic, but also thrilling to be able to follow up on such a significant result," stated Marcelle Soares-Santos of Fermilab, a member of DES and lead author of the paper describing the search and results. They faced a significant hurdle since the search area was so large: 700 square degrees of sky, or about 2,800 times the size of the full moon. The team observed large swaths of this region several times over a period of three weeks but did not detect any unusual bursts of visible light. They used this information to place a limit on the brightness that can serve as a benchmark for future attempts. "This first attempt to detect visible light associated with gravitational waves was very challenging," states Berger, "but it paves the way to a whole new field of astrophysics." 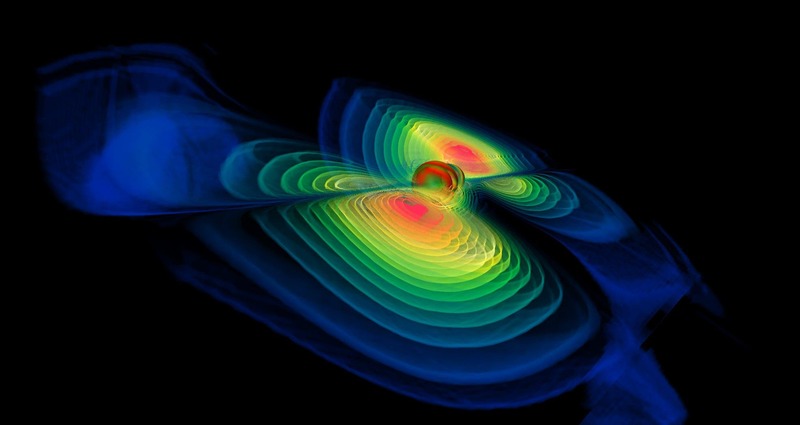 The team plans to continue searches for visible light from future gravitational wave sources. The Dark Side of the Universe –"Mapping an Invisible Force"